If someone asked me to name a three piece Thrash band then my answer would almost certainly be the mighty Destruction (with perhaps a passing mention of Exciter) but I feel I could be about to add another name to that list! Brazilian's Nervosa have not only released one of the best old-school Thrash albums I've heard from a new band but they are all female. 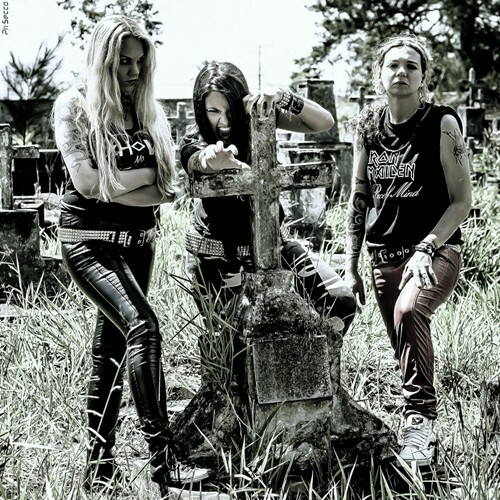 These three are, quite simply, a female Destruction and 'Victim Of Yourself' is a brutal and blood curdling debut! There is no preening or diva attitude here as all three can obviously play their instruments backwards and can write songs to match their musicianship. 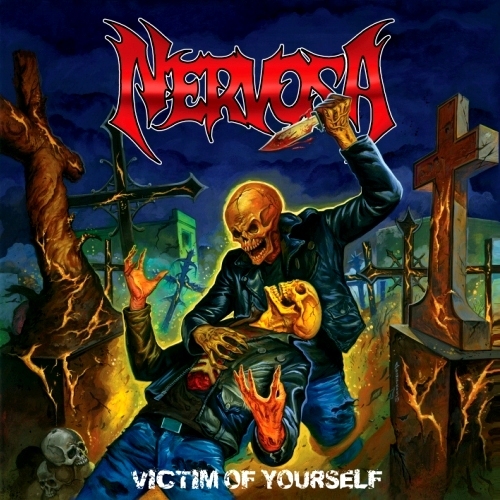 Some cheesy song titles aside, such as 'Nasty Injury' and 'Into Mosh Pit' (in all honesty probably a translation issue) Nervosa have more balls than most blokes I know, such is their level of attack! Vocalist/Bassist Fernanda Lira is a perfect Thrash front person. She even sounds like Destruction's Schmier for most of the album. Guitarist/Backing Vocalist Prika Amaral has enough meat in her riffs and solos to cause a nuclear meltdown and Drummer Pitchu Ferraz is simply mind blowing in her ferocity. This might be old-school but it's definitely not loose. 'Victim Of Yourself is hugely technical and as tight as a man's buttocks whilst bending over in a prison shower to pick up the soap! After 'Intro' which probably isn't necessary, but sets the scene perfectly, first track proper 'Twisted Values' hits you like a fully armed missile and the album doesn't let up for its forty five minute running time. There is almost nothing better than putting on a cracking Thrash album, cranking up the volume and hurting your neck with a bit of extracurricular head banging and this is a cracking Thrash album and it's well produced. There are lots of new, retro sounding, Thrash acts around nowadays and none of them are doing anything original, but...it's heaven to hear one done this well and in Nervosa's case it proves, beyond a shadow of a doubt that, women can play. I knew that anyway but I also know some that will turn their noses up purely for that reason. It'll be their loss because 'Victim Of Yourself' is superb!